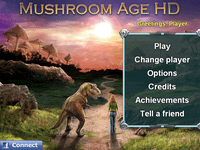 Join a search for true love in Mushroom Age, a unique hidden object adventure! Help Vera track down her lost love through thrilling epochs of earth's past and future! Vera's fiance, Tom, has gone missing a few days before the wedding. So she embarks on a race against time and through history to find him and save the world from futuristic evil powers that want to change history and destroy the world. Solve interesting puzzles and play mesmerizing mini-games with pre-historic characters like a dinosaur and a caveman, historic personages like Socrates and Nostradamus, robots and bad guys from the future, not to mention characters not bound by the confines of time! Featuring eye-popping puzzles and brain-bending mini-games, Mushroom Age is a wild adventure for the whole family.